Leonardo DiCaprio as "The Great Gatsby." 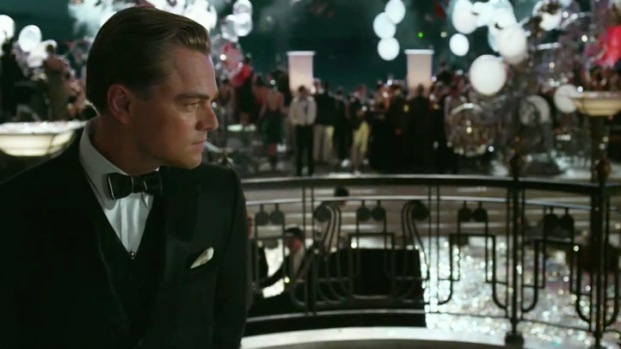 The first trailer for "The Great Gatsby", starring Leonardo DiCaprio, Carey Mulligan, Tobey Maguire and Joel Edgerton, is a reminder that few directors throw a party or bring a modern spin to a historic period like Baz Luhrmann. This is Hollywood's fourth stab at retelling F. Scott Fitzgerald's classic tale of the American Dream, and judging from the trailer, it has a chance to be the first one that's truly excellent. The most recent, 1974 version, starring Robert Redford and Mia Farrow was pretty, in its way, but kinda meh. DiCaprio's innate boyishness is perfectly suited for Gatsby's underlying insecurity, and Mulligan (as she did so brilliantly in "Shame") brings a delicacy to Daisy that hints to the character's instability. And then there's the look of the film, which is incredibly lush. As he did in "Moulin Rogue," Luhrmann has conjured a fashion sensibility that straddles two eras separated by decades, and uses modern music that succinctly captures the mood of a bygone time--Jay-Z's and Kanye West's "No Church in the Wild" somehow works perfectly over the start of the trailer.